of April. Several educational events are scheduled at various locations during April. nt civilization with an impressive documented history, the presentation promises to be a local traveler’s insight into the exotic Far East. On April 17, there will be a presentation on Beaver Island Michigan held at the Albion District Library at 12:15. The entire Midwest and possibly the entire country is aware of the very touristy vacation spot on Mackinac Island. However, even many Michiganders are unaware of an equally impressive settlement in Lake Michigan on Beaver Island. The island is the largest land mass on Lake Michigan that has become a popular traveler and tourist destination. This presentation should be very interesting and enlightening. On April 18, Albion College is host to a talk by Alexander McCall Smith. Smith is a Scotsman who is author of “The #1 Ladies Detective Agency” series. The collection of mystery stories is set in Botswana and will highlight the differences and similarities in the detective styles of Africa vs America. This speaking engagement will be held at the Goodrich Chapel on the Albion College campus at 7:00. World Book Night will be celebrated on April 23 in Albion. There will be brief readings in various stores all around downtown. World Book night is celebrated around the globe with the message that books are fun—and they can be life-changing. Publishers give away books to encourage reading for fun. All of the above events are free and open to the public. 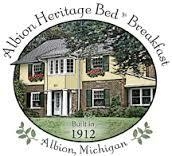 This entry was posted in Things to Do and tagged Albion Heritage Inn, Things to Do by admin. Bookmark the permalink.